princess bubblegum. . Wallpaper and background images in the アドベンチャー・タイム club tagged: adventure time princess bubblegum. This アドベンチャー・タイム photo might contain スペースシャトル, スペース ・ シャトル, アニメ, 漫画, マンガ, and コミック. @astigpinoy It's not an anime. It's music. 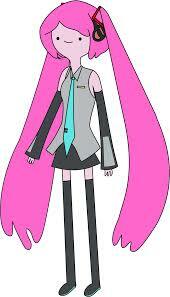 VOCALOID.